I guess it was only a matter of time before some Kate Spade inspired spread came about. I used a mishmash of different shops as well as online print outs. Check out my Instagram @lifeinmascara for better tagging. 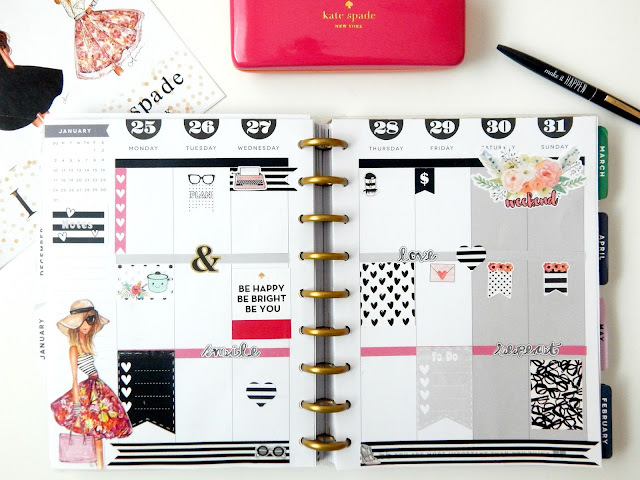 Planner Bowtique- pink, black, and grey washi strips, page flag, notes, and to do list. My Newest Addiction- Weekend banner, plan glasses page flag, and floral page flags. Pookie Bear Cuties- Crockpot sticker. Camila Ximena- Glasses, high heel, Starbucks mug.